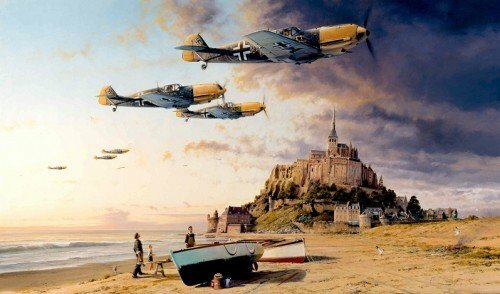 The ancient Norman monastery on Mont St. Michel provides the majestic backdrop as a group of Me109s race across the coast returning to their forward base in northern France after a fighter sweep across the English Channel in early 1941. During the spring of 1941 almost all of the great Luftwaffe fighter leaders duelled across the English Channel on a daily basis with RAF Fighter Command. But the Abbey of Mont St Michel has seen it all before: built by the Normans on a solid rock of granite rising 250 feet out of the sea, this ancient monastery has witnessed conflict over almost a thousand years. It now plays backdrop to Robert Taylor’s iconic painting. 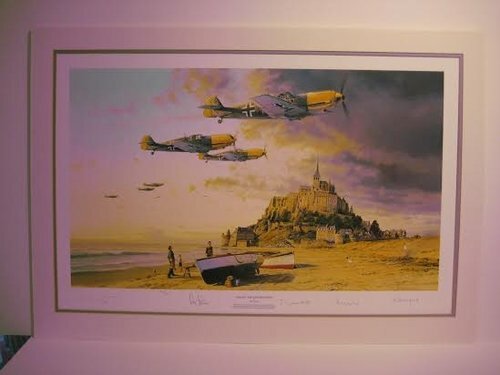 Using the latest imaging and printing technology, these high definition Giclée Studio Proofs now allow us to replicate the sophisticated artistry of this Robert Taylor Masterwork. Each of these magnificent masterworks is released pre-stretched from the Military Gallery studio ready for the frame of your choice. Every canvas is signed by Robert Taylor, stamped on the back, hand-numbered and issued with a Certificate of Authenticity.